A lot of people bought Wii Fit in hopes of using it to get in shape, but few of them did; for most people, the game wound up gathering dust next to the ab-master and the thigh master and the exercycle, just another good intention gone bad. Wii Fit Plus, a new, expanded version of the game, attempts to change this, not so much by improving the exercise component as by vastly increasing the fun component. The best part of Wii Fit was a series of mini-games that let the player’s avatar ski or hula hoop, so it is fortunate that Wii Fit Plus has added, besides a handful of exercises and some minor other additions, 12 brand new mini-games. The result may or may not be a better workout game, but it is undeniably a lot more fun. For those of you not familiar with Wii Fit, it is an exercise game that utilizes the Balance Board, which gauges shifts in the player’s weight when stood upon. Exercises are a mix of simplified yoga postures and standard strengthening exercises like push-ups. In yoga, players are asked to keep their balance, and the game tracks how steady they are. In strength exercises, the board simply sees if you are doing something approximating the current exercise, but offers little useful feedback. These exercises are lead by alabaster-skinned virtual personal trainers with the personality of cream of wheat. My reaction to Wii Fit as a home gym was that an exercise DVD would be just as good, and considerably cheaper. The mini-games served to make things a little more interesting, but only a little. Some mini-games offer a pretty good workout. An elaborate obstacle course left me a little breathless. A juggling challenge has your avatar juggling while balancing on a giant ball, and keeping your weight centered on the balanced board while emulating juggling is a challenging exercise in coordination. Some mini-games also require brainpower. One requires you to add numbers with your hips; add to 10 by hip-bumping nearby bumpers labeled 5, 2 and 3. Another has players controlling tiltable platforms, with the remote and balance board; it requires a lot of mental and physical coordination to tilt platforms at opposite angles to guide balls into their proper bins. Other entertaining mini-games include a martial arts game in which you must mimic your fellow students and a marching band game in which you march while waving your hands at specified moments. You can also skateboard or get into a snowball fight, and there are a few modified versions of the original’s mini-games. 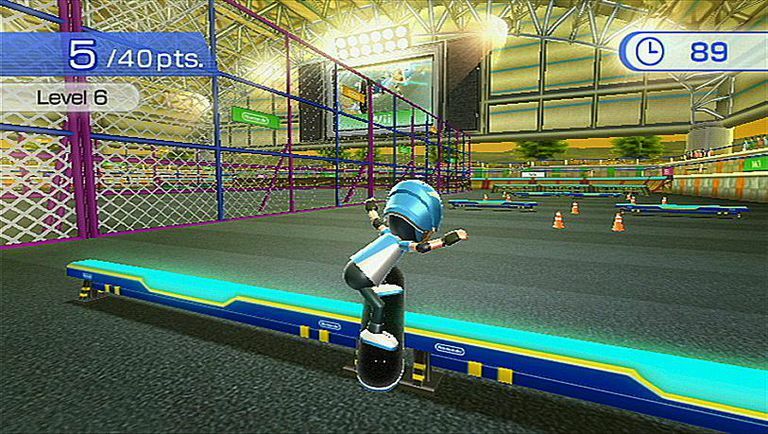 Wii Fit Plus has almost anything you would care to use a Balance Board for. There is even one golfing mini-game that analyzes your swing according to how you shift your weight; I’m hoping it will help me improve my Tiger Woods skills. Wii Fit Plus has also added a rudimentary workout routines section. You can choose a themed workout targeted at posture improvement or weight loss, among other things, or combine a series of these routines as you like. You can also design your own routine, but while Nintendo’s pre-packaged routines combine mini-games with yoga and strength exercises, your own routines cannot include any mini-games. This part of the game feels like a rough sketch for a final version that was never developed and is very disappointing in what is otherwise a very good package. The Wii Fit franchise didn't get a proper custom routine system until the follow-up, Wii Fit U. While the original Wii Fit was only available bundled with the Balance Board, Wii Fit Plus can be purchased separately, which is good news for those who already have a Balance Board. Wii Fit Plus is still somewhat lacking as an exercise game, and there are certainly better Wii games for a serious workout, but as a Balance Board-centered mini-game collection, the game is a lot of fun. And if Wii Fit Plus gives players a workout through having fun, then neither the game nor the players will gather any dust.